Will John Cox’s vision to end homelessness work? 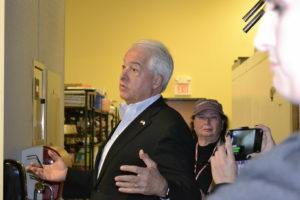 By Donna Westfall, October 25, 2018 – When you first meet gubernatorial candidate, John Cox, you can be assured he will look you in the eye and give you a firm hand shake. Seasoned politician? I think not although he’s certainly learned the basics of repeating his message often. Professional businessman is more like it. For a man who’s net worth exceeds an estimated $200 million, I found him to be very down to earth. He hasn’t forgotten his humble beginnings and the hard work it took along the way to achieve his goals. Some of those goals; becoming an accountant and a lawyer as well as real estate developer – building apartments. Here’s the thing. John Cox related that in Indiana he can build wonderful, beautiful apartments for $90,000 a unit. In California, that same unit would cost $200,000 or more in the North Coast area, $500,000 in Los Angeles and $700,000 in the Bay area. Why? It’s not the cost of the land. It’s government costs adding to the housing crisis. Because of all the regulations and red tape. Delays in approvals. Frivolous lawsuits; decades old law called CEQA (California Environmental Quality Act) that is being used as a litigation tool to hold up development. Outrageous costs. Too many agencies and hoops you have to jump through which mount up the costs. Just look at the California Coastal Commission and evaluate all the projects they have held up or squashed, not to mention the fees they charge. The middle class are disappearing. People and businesses are leaving the State. Another thing, government can’t solve all the ills of society, but they can partner up with organizations. Let’s back up for a moment. Homelessness comes from a variety of sources. Addictions being at the top of the list. Drugs and alcohol. Then there’s the mentally ill. Then there’s more and more people becoming homeless due to loss of a job, sickness or other disaster; they can no longer afford to live with a roof over their heads. With few safety nets in place, few rescue shelters, people find themselves on the streets. And that, says John Cox, is the crux of the problem. It’s too expensive to live in California. The key issue is AFFORDABILITY. If there’s only one message candidate Cox get’s across it’s to admit that it’s no longer affordable to live in California. With our legislature raising gas prices without a vote of the people; (something Gov. Brown said he would never do), we now have to hope that the public doesn’t buy in to Sacramento’s whining that they need that gas tax increase to repair road/bridges/potholes. How ridiculous. They have had their hands in the cookie jar taking out oodles of money from the transportation tax fund instead of repairing our roads. As Governor, John Cox is in favor of repealing the gas tax and would put a stop to the money pit called the “bullet train.” That alone would help fix a boatload of problems by stopping the financial hemorrhaging. 3 Responses to Will John Cox’s vision to end homelessness work? 1) While costs are too high, and there are far too many regulations in California, the costs stated are very inflated. It simply doesn’t cost that much to build apartments on a per unit basis. Again, it does cost too much, but it is important to be honest or risk sounding like liberals – exaggerating everything. 2 California is far beyond repair. There is no ‘coming back’ from where the government has taken us. The best thing anyone with any amount of resources can do is to move to another state. I have been in the process of just that, selling all my properties in California except one – it will probably be sold next year. The relief of not owning rental and commercial property in this backwards state can not be overstated. Between a state government that is clueless, a local government that is corrupt, drug induced zombies walking the street, and the 9th circuit court ruling that homeless can camp wherever they want – this place is toast. The beauty of Del Norte will succumb to the string of bad decisions, and tourists will find elsewhere to spend their money. Wouldn’t you? Good luck to those stuck here, you will need it. So please tell, where is this Shangri-La where you will go? There are still areas of the U.S. that common sense is not uncommon. Each individual has to decide for themself where the best place to retire is. Perhaps the most important thing in deciding this ‘Shangri-La’ is taking the time to get honest measured data-points that represent important categories of interest for you and moving forward from there. Knowing several individuals that have worked in the area, and retired elsewhere, I don’t know of one who regrets the decision – but each of them did their due diligence to find the right place.